Cars and trucks. Attach a scrub brush to your pressure washer and you can have a clean car that looks good as new! Some say you need a sponge to get it completely clean right after, while some day it isn’t needed. Well, the choice is up to you. Just be sure you clean your car with the right soap. Fencing. C’mon. Who doesn’t hate cleaning every bar of the fence by hand? Maybe someone who has a lot of time! Nowadays, everyone’s busy and we want our task to be done in a wave of a magic wand. That’s why pressure washers exist. Cleaning the fence won’t be much of a hassle now. Garage Floors and Driveways. 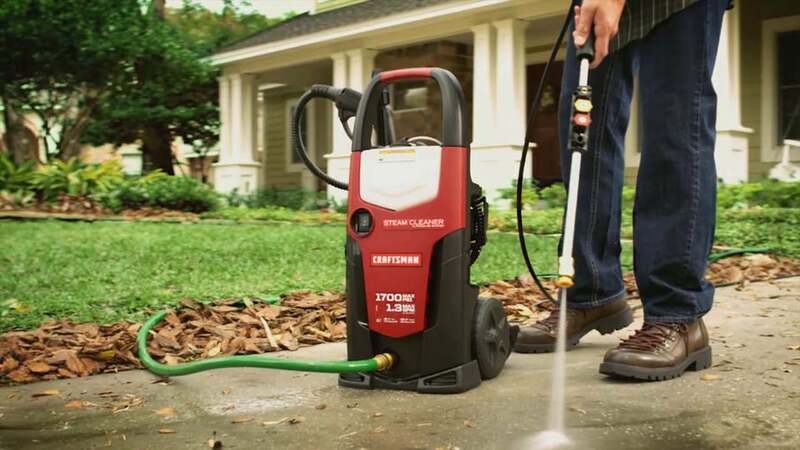 Wash away every single sand and soil from your garage floors and driveways with a pressure washer! Almost all people who buy one has the same reason: to keep their garage floors and driveways clean. Grills. Yup. It’ll only take about 10 minutes to clean your BBQ grill with a pressure washer! All you have to do is detach the propane and the electrical wires and you can blast off the water from that convenient washer. No more soaps. No more hand-rubbing. No more et cetera! Now you won’t have to worry about eating barbeque that smells (or even tastes) like soap. Home Exteriors. Who would’ve thought pressure washers can go this far? They can clean your windows and home exteriors like vinyl or brick! Pretty convenient, right? Keeping your house clean from the outside shows how concerned you are with cleanliness. Keep ‘em clean with pressure! Outdoor Furniture. Your outdoor furniture should be taken care of more than your indoor furniture. Why? Because they’re more exposed to pollution and all kinds of dirt. Cleaning them is sometimes a burden. But you have to wake up. Pressure washers exist in this era! Now your wood, plastic, or vinyl outdoor furniture can be squeaky clean! Tile Patios. Greasy. Soiled. Disgusting. That’s what your patio would look like without pressure washers. You wouldn’t want your patio welcoming summer that way! Act on it! Regularly clean your patio with a pressure washer and you won’t have to deal with grubby tiles all throughout the year. Walkways and stairs. The front entrance of a house is one of the most important parts of the entire house. I mean, who would want to enter your house if your entrance isn’t clean and appealing? People would think you’re too lazy or you’re not welcoming any visitors. With a pressure washer, however, walkways and stairs can be a loving welcome. It’ll only take less than 15 minutes to clean them all thanks to the pressure washer.